Inventor Adds Two New Products to His Patented Line of Wall Mounted Locking Gun Racks to Deter Gun Theft, Help Protect Children and Limit Personal Liability From Unsecured Guns in Homes, etc. Tyler, TX (PRWEB) August 23, 2008 -- Firearm Security Racks Inc. maker of the 'Gun-Cuff' wall mounted locking gun racks (http://gunracks.tylerrose.com) has developed two new types of affordable locking gun racks designed to deter gun theft, protect children and limit personal liability from having loosely stored firearms in homes, etc. 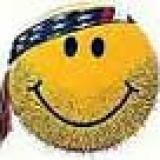 According to the FBI, a home burglary occurs somewhere in the United States every 15.4 seconds. Statistics show that 150,000 guns are stolen each year in house burglaries and approximately 500 children die each year from unintentional gunshot wounds according to the Centers for Disease Control and the Census Bureau. Don Graham-inventor of the 'Gun Cuff' patented wall mounted locking gun racks, has added two new products to his line of locking gun racks in an effort to protect guns from being stolen and to protect children from unsecured guns that are normally stored loosely under beds or in home closets etc. 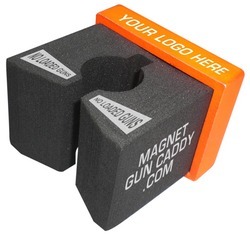 In 1996, Mr. Graham was fortunate to be issued a patent as well as the trademark 'Gun Cuff' on two types of wall mounted locking gun racks, one that will hold up to 9 rifles and shotguns ($79.95) and a handgun rack that will hold up to 3 pistols of various sizes ($49.95). 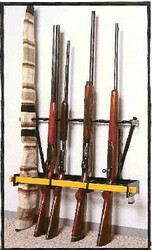 Recently he has added two more types of gun racks to his product line. RoadLoK Security has again proven that motorcycle security and performance go hand-in-hand with the new RoadLoK Arachnid M1 by Beringer! Orange County, NY (PRWEB) August 22, 2008 -- The all-new RoadLoK® Arachnid® M1 manufactured by French friction specialists, Beringer®, is the world's first high-performance caliper and locking system compatible with all radial-caliper-equipped motorcycles. Beringer has successfully incorporated RoadLoK Security's patent-pending locking technology into their high-performance radial-mount caliper to produce a sleek and stylish solution to motorcycle theft. Beringer has been manufacturing brakes for racing application for more than 15 years boasting unequaled performance and superior quality. Because Beringer manufactures calipers and rotors for both street and race applications--with no performance differences between the two--the rider gets a 16% reduction in unsprung weight on the front axle and 20% greater stopping ability over stock--not to mention, unequaled security that only the RoadLoK system can offer. The new Arachnid M1 features a removable BrakeBolt™ locking pin and ABLOY® EXEC lock mechanism. The system is integrated into a powerful Beringer Aerotec® 4-piston, radial-mount brake caliper; the Arachnid M1 is compatible with any motorcycle using 108mm radial-mount front brake calipers. 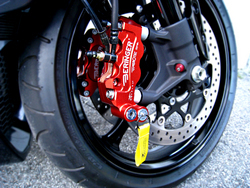 RoadLoK Security's "universal-fit" approach marks a company-first: this is a new locking system vaunting coverage for all Japanese sport bikes outfitted with 108mm radial calipers produced back to the 2003 model year! The new M1 is even compatible with several European motorbikes using the same popular radial-mount offset. The new Arachnid M1 system is currently available through RoadLoK Security and Beringer. The M1 is available in a wide range of anodized colors including black, blue, gold, silver, purple, titanium and eye-catching red. All systems come complete with a matching Beringer Aerotec 4-piston radial-mount caliper. Kit pricing starts at $1999.99 (USD) for a complete billet braking package!